Population, Greenhouse Gasses, Education, Religion. These Solutions were sent to all governors, The President, and Congress plus 10 cabinet secretaries on August 15, 2008 after being posted on this web since January 7, 2008 in order to pretest acceptance. In the past the major form of population control was famine, pestilence, and warfare. Lands change hands through warfare to gain land for increasing populations of tribes because the existing lands that they controlled would not support the increasing populations. You see that in Africa today. People in Africa traditionally had many children because only a few would survive to adulthood because of disease and famine. Our doctors come there to fight disease. So that leaves famine and warfare for population control because they still have many children. It also encourages temporary solutions of Africans, which results in killing off the animals and cutting down the trees. Then there is nothing left but too many people. Mathematically zero population growth is one child per family, not two. This is because of the ever increasing life expectancy. In 1900 people lived to an average age of 45 years. Today it is 78 years. If every couple had two children in that period, that would be a population increase, not zero population growth. Don't get me wrong. I am for every family having as many children as they want without government interference. Biologically a woman can have up to 26 children. The fact that she has less is an informed family choice. I do think they should teach the mathematical logic of zero population growth, as explained above, in high school civics class. It would not be preaching. It would be making correct information available to add to future families' informed choices. Then if they still want to have up to 26 children, God bless them. One child per family would be somewhat less than zero population growth if there were no divorces. However with a 50% divorce rate there could be remarriages of a divorcee who had one child through the former union marrying a single person who had no children. The new marriage would possibly have a child; thereby raising the average (two children from one spouse and one child from the other spouse is an average of 1.5 children per spouse when one partner is divorced. Adding in the increase in life span over a generation mathematically amounts to zero population growth. ). Some might choose to have no children while others will choose to have more than one child after all considerations. Hopefully this will all balance out. If people are concerned with greenhouse gases caused by carbon dioxide, the largest source of carbon dioxide comes from people. That is what we breathe out. Plants absorb carbon dioxide and emit oxygen. In addition, the greater the pressures of population, the more we demand natural resources and the industries that support them. For example, reducing automobile emissions or building new freeways is just a temporary solution. Chances are soon after the new freeway is done or the emission controls are in place, the population will have grown to where it is just as bad as when we started. Ever increasing population is like a pyramid scheme. It just cannot sustain itself, so we have famine, pestilence, and warfare to fall back on. If we are able to delay these choices a bit, then we could all be pulling around oxygen tanks and wearing breathing masks. Given those choices, zero population growth seems to be the best overall solution. Not imposed. Voluntary. The size of the Earth is limited. The amount of natural resources is limited. Zero population growth should be with worldwide cooperation. Trust me this will work. It is not a third rail of politics. Last August (2007), I tested it out on the 'youtube' readers without complaint. I discussed it on their more serious blogs on Global Warming. No one had a problem with it. I have sent it out on emails and found a 20 to 1 explosion of resending it to others. I only got back compliments. Please run with this one. Ethanol works fine for diesel engines, but it is alcohol. In my opinion, it does not provide good results for gasoline engines as a means of saving use of oil based fuel. My degree is in physics. I know what I am saying. If it is made from corn, you might consider it corn liquor. If ignited, alcohol burns slowly with a blue flame much like alcohol on your cherries jubilee. Gasoline engines need something much more volatile similar to gasoline. They need more punch. As an experiment, if you poured gasoline on your cherries jubilee, igniting it with a match would be explosive indeed. I live in an area where they add 10% ethanol to the gasoline. I get 10% less gas mileage. I have to stop for gas 10% more often with the 10% ethanol, so the ethanol is not doing any good, costs more energy to produce, robs us of corn, and costs us more money. It has zero benefit for gasoline engines on mileage, but it does keep the farmers happy. You would have the same affect requiring all of us to load up 10% of our fuel tanks with washed gravel. We would still stop at the gas stations 10% more often, but the gravel would stay in our fuel tanks and be truly a "renewable" resource. We might be even able to afford corn on the cob once in a while. Please check with scientists who are not getting money from the public trough to color their answer. There is just too much junk science out there. Better still monitor your own gas mileage. You would have to know what it was before the ethanol was added, however. This is what I did. On the slight plus side, a small amount of alcohol will get rid of condensation water in the bottom of the tank. Much, much less than 10% of the fuel tank is needed for this occasionally. Additionally I did not weigh any possible emissions pollution advantages. Possibly less ethanol will give the same possible emissions reduction if that is the motivation. That would just be a stop gap measure that would eventually be negated if the population grows past one child per family as discussed above. I understand that carbon dioxide is claimed to be the real cause of global warming. Cars emit carbon monoxide, which is different from carbon dioxide. Carbon monoxide is poisonous, and carbon dioxide is not. Dry ice is frozen carbon dioxide. I can't read using fluorescent light bulbs. My eyes will strain, become seriously irritated, become blood shot, and I have to stop reading under fluorescent lighting. I have found that I can ONLY READ WITH INCANDESCENT LIGHT BULBS. Possibly our legislators forgot to factor all this in when they decided to ban incandescent bulbs. That is truly terrible! Possibly new technology can eliminate this problem. By voluntarily having one child per family as explained above, the burgeoning cost of ever increasing school facility needs will be reduced. This will allow more money to be spent on smaller class sizes without increase in taxes because we would not need more facilities on average to gobble up tax funds. Each child should be encouraged to compete with his/her own level of knowledge in order to improve, rather than competing with other children. In that way the smarter child will not coast, but will continually improve. The slower child will continue to improve and not be frustrated with impossible goals. The old army slogan, “Be all that you can be.” comes to mind. Parents should provide the cost of transporting their children to school unless they cannot afford it. The latter would be a special circumstance. The same reasoning should require parents with more than one child to pay more costs to educate them if they can afford it. They should be means tested. All of this should apply only to new family member births. The others would be grandfathered in. I strongly believe not to pull the rug out from under existing families just because a law is changing. It should apply starting 9 months after ratification for new births only. 1. There are those that work for the government such as teachers, military service people, police personnel, fire fighters, government service workers, and postal workers. These people generally seek security of income without having any competitive urge. They tend to take a position that the government should be all things to all people, - cradle to grave. These people tend to be liberals. Many politicians fall into this category. They often are creative from a literary or art perspective; however, they do not tend to be entrepreneurial. They don’t have to find needs for products and services, fulfill those needs, make payrolls, and hopefully eventually make a product or fulfill a need that is in demand and provides funds for them to live on and save after paying all expenses. These expenses also include taxes, replacement depreciation, and have inflation factored in. These liberal people will often also figure that they better spend every penny they get, including traveling, because the government can’t tax what they don’t have. 2. There are those that work for themselves or others in companies that must show a profit. They are often creative, competitive, and they develop new products and services that they hope are in demand. Getting started is quite risky with a high chance of failure. They are entrepreneurs. They find needs for products and services, fulfill those needs, make payrolls, and hopefully eventually make a product or fulfill a need that is sufficiently in demand and provides funds for them to live on and save after paying all expenses including taxes, replacement depreciation, and inflation. These people tend to be conservatives, and they are the future of this country. They make things happen. To the extent that government increasingly taxes entrepreneurs, they will give up or go out of the country. They will also sometimes figure that the risk is just not worth the hoped for rewards. Then they will sit back and coast through life expecting the government to take care of them after minimal expenditure of time and full expenditure of all the money they receive. Because the teachers are of the first group, they tend to teach the philosophy of the liberal to the detriment of nurturing entrepreneurs of the future. We need entrepreneurial classes taught in high school. Guest speakers can come in from the business community to show what running a business is all about. Adventure capitalists can come in showing what they are looking for in startup companies to cause them to be interested in investing funds. The whole process will be explained to the student. This will provide knowledge to develop new businesses in the future. It is far better than the states competing agressively for the limited number of pre-existing businesses out there with ever increasing tax incentives. However, incentives will have to be used in oder for businesses to voluntarily hire Americans at home rather than their hiring off-shore company employees. For businesses it is all a matter of dollars and cents. What is best for their bottom line? Taxes to confiscate wealth after it has already been taxed as income through estate taxes and punishment taxes of businesses will just drive people of wealth and global businesses away. I believe that individuals and businesses should be left alone to develop their successes as much as and as fast as possible. This, of course, applies as long as they don't harm others. People should be given incentives, so they can figure out on their own to do something that the government wants them to do on their own. It is a failure of government when it encroaches on wealth of individuals and businesses after it has already been taxed. Cleverly controlling government costs by thinking outside the box, such as the social problems I helped solve (as is shown on my web site) will save billions of dollars. However, government spending restraint should also come into play. In the past the government officials could not wait to spend the huge amount of money fast enough when the savings from my solutions were realized. One billionaire advocated higher estate taxes. Could the motivation be to drive profitable businesses into forced sales at fire-sale prices just to pay the estate tax when an owner dies? Is buying these government induced distressed properties their business motivation? To reduce the fear of liability, a class can teach how to represent oneself in court in order to keep expense exposure down. Judges can be guest speakers. This is not so preposterous. To win in court is just a matter of using common sense coupled with the guidelines of the very clearly written “Rules of Civil Procedure” provided by each court. I took a leading law firm to court for legal malpractice. I represented myself. They had 22 partners and owners that I was suing at the superior court level. I won a settlement. It was easy. Please see the write up on my web site. I also took on OSHA (Occupational Health and Safety Administration) representing myself in Federal court. They flew in 3 attorneys from Washington, D.C. I won that one, too. It was easy. Lawyers like to say that if you represent yourself in court, you have a fool for an attorney. Baloney. That expression is designed to maximize law firm income. I learned that, win or lose, each side pays for his own attorney’s fees. 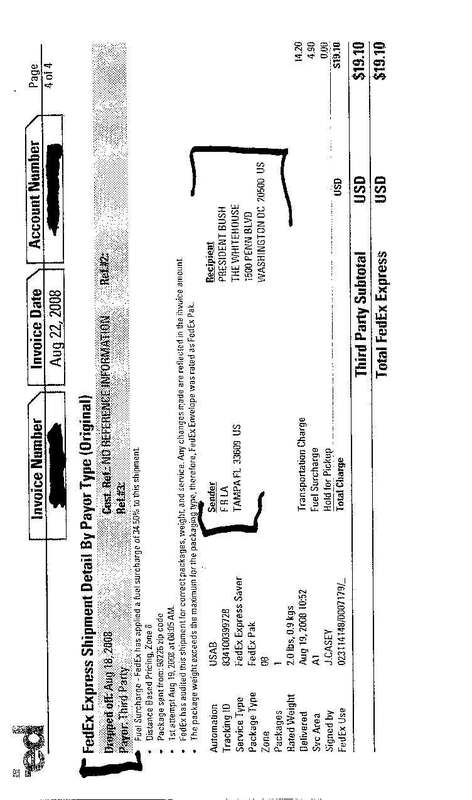 Sometimes a generous judge will give me, the winner, around $600 statutory attorney fees when my actual attorney fees can be $100,000 or more, but this is rare. Faced with this, I am far better off representing myself. In that way my expenses are minimal, and my rewards are much, much greater. In my opinion, nothing can dry up seed money for a startup company faster than lawyers’ fees to fight a lawsuit. If I can win my case or get a settlement by representing myself against a prestigious law firm, then I am certainly not a fool. If lawyers claim I have a fool for an attorney as a winner, then what does that make them? I strongly recommend that courses be taught in high school and business school on how to represent oneself in court. I am not special. If I can do it, others can do it. Please see my video on this subject at http://youtube.com/franksolutions by copying and pasting this address in the address field and clicking the return key. Please also see my write-up for legal tort reform for businesses to avoid legalized blackmail. I am a Christian, but I don't flaunt it. I find it enhances and encourages my willingness to do good and help my fellow humans. The teachings bring out my conscience. When I find a social problem, I want to exert maximum effort and concentration to get it solved. I can't in good conscience just let it go unsolved. This year my wife and I sat in on a "Rap with the Rabbi" meeting. I did it to gain a better understanding of the Jewish faith. I learned that they believe the Messiah is in all of us to different extents. I came away feeling that it is incombent for each of us to strive to have as much of the Messiah in us as we can on an ever increasing basis. To me that interprets to our capacity and willingness to do good. One can be a Christian, a Jew, a Muslim, an Atheist, or anything else that we use to comfort and guide our lives. For me it is all important to contribute to the well being of mankind and do good. The road we take to do it is not important. Scientifically, I could nit pick and tear apart everyone's belief system, but what would I have left if I was successful? I feel it is best to embrace everyone within their own belief system and work toward the common good of mankind. This is providing they don't harm others. I feel it is by how we live that we can accomplish a lot and passively by our example encourage the good in others. Please see my video on this subject at http://youtube.com/franksolutions by copying and pasting this address in the address field and clicking the return key. Over the past eighteen years I came up with 16 solutions for major social problems. They went to all state governors, all U.S. Senators, around 200 U.S. Representatives, and the President. All were either adopted or are in the works for adoption. They are on my web site at http://www.franklinlacy.com . My verifiable solutions include Proven Personal Results for USSR Demise (1984 - 1989), Welfare Reform (April 1995), Also Medicare/ Medicaid/Healthcare (In works April 9, 2001 - Present), Elderly Rights to life and tax saving/Terri Schiavo (August 27,2004), Social Security, Tort Reform, Sexual Predators (May 23, 2005), Illegal Immigrants (April 7, 2006), Suicide Bombers/Iraq (April 22, 2007), Greenhouse Gases, Population, Education, Ethanol Hoax, Religion Compatibilities (January 4, 2008). My Greenhouse Gases, Population, Education, Ethanol Hoax Solutions are spelled out below. On January 4, 2008 they were posted on the internet and emailed out, but I did not send them to you until now. This is so that I could pre-test the voter acceptance, which was great. There were no objections. My Iraq solution of April 22, 2007 includes causing them to become a more peaceful country by impressing upon President Bush the importance of politically dealing with the tribal chiefs directly. It followed my trip to 5 Middle Eastern Countries in March 2007 in order to seek solutions. Dealing with the tribal chiefs directly caused them to realize that the United States is not an invader but is a friend. Their people stopped shooting at our country’s soldiers and helped reveal the location of Improvised Explosive Devices (IED’s). They also revealed the location of terrorists. In February 2007 we had an increase in troops, which led to an increase in American casualties until May 2007. Much of our government was in favor of abandoning Iraq by immediately pulling out our troops. On April 22, 2007, my solution to directly deal with the tribal chiefs and my solutions to end suicide bombers were sent to President Bush, Secretary of Defense Gates, Secretary of State Rice, Homeland Security Secretary Chertoff, all of the U.S. Senators, approximately 160 members of the U.S. House of Representatives, and all 50 state Governors. Because of my prior successes in solving quite a few social problems, my letters tend to be read. In May 2007 our country started dealing politically with the tribal chiefs of Iraq, and American casualties in Iraq dropped to as little as 3 per week during the rest of 2007 as a result. In August 2007, John Bolton told me that our government hadn’t been dealing with the tribal chiefs prior to May 2007. The experts are now recognizing that this is the major change that turned around the course of the Iraq war. We all want to get our forces out of Iraq as soon as possible. It’s a matter of how we want to do it. My practical solutions that are being implemented to get us out will leave a job well done and a friend for life. The choices are clear. My successful efforts in 1984 – 1989 contributed to the Demise of the former Soviet Union. Please verify this on my web site. 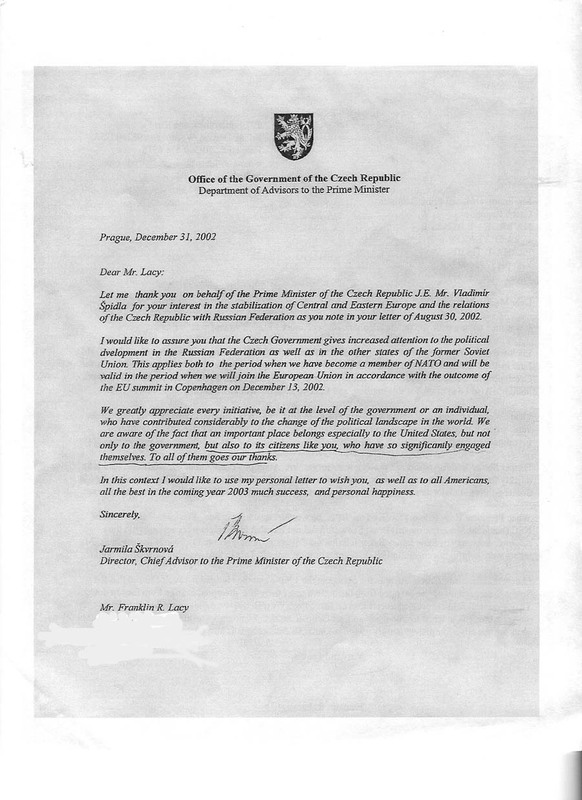 On it is a letter of gratitude from the Prime Minister’s office of the Czech Republic in addition to other evidence. Last August, I was having dinner with Richard Allen, President Reagan’s former National Security Council advisor. Mr. Allen told me that President Reagan has been given credit for the Soviet Union demise because he maintained a strong military. I had asked my government not to release my name, and they obliged. No one would give up a form of government unless they had something they thought was better. I convinced the Soviets of a better way. Please see my web site on how I did it. In the past the major form of population control was famine, pestilence, and warfare. Lands change hands through warfare to gain land for increasing populations of tribes because the existing lands that they controlled would not support their increasing populations. You see that in Africa today. People in Africa traditionally had many children because only a few would survive to adulthood because of disease and famine. Our doctors come there to fight disease. So that leaves famine and warfare for population control because they still have many children. It also encourages temporary solutions for Africa, which results in killing off the animals and cutting down the trees. Then there is nothing left but too many people. If people are concerned with greenhouse gases caused by carbon dioxide, the largest source of carbon dioxide comes from people. That is what we breathe out. Plants absorb carbon dioxide and emit oxygen. In addition, the greater the pressures of population, the more we demand natural resources and the industries that support them. For example, reducing automobile emissions or building new freeways is just a temporary solution. Chances are soon after the new freeway is done or the emission controls are in place, the population will have grown to where it is just as bad as when we started. Ever increasing population is like a pyramid scheme. It just cannot sustain itself, so we have famine, pestilence, and warfare to fall back on. If we are able to delay these choices a bit, then we could all be pulling around oxygen tanks and wearing breathing masks. Given those choices, zero population growth seems to be the best overall solution. Not imposed. Voluntary. Awareness of the alternative will cause the change. The size of the Earth is limited. The amount of natural resources is limited. Zero population growth should be with worldwide cooperation. Ethanol works fine for diesel engines, but it is alcohol. In my opinion, it does not provide good results for gasoline engines as a means of saving use of oil based fuel. My degree is in physics. I know what I am saying. If it is made from corn, you might consider it corn liquor. If ignited, alcohol burns slowly with a blue flame much like alcohol on your cherries jubilee. Gasoline engines need something much more volatile similar to gasoline. They need more punch. As an experiment, if you poured gasoline on your cherries jubilee, igniting it with a match would be explosive indeed. I live in an area where they add 10% ethanol to the gasoline. I get 10% less gas mileage. I have to stop for gas 10% more often with the 10% ethanol, so the ethanol is not doing any good, costs more energy to produce, robs us of corn, and costs us more money. It has zero benefit for gasoline engines on mileage, but it does keep the farmers happy. You would have the same affect requiring all of us to load up 10% of our fuel tanks with washed gravel. We would still stop at the gas stations 10% more often, but the gravel would stay in our fuel tanks and be truly "renewable". We might be even able to afford corn on the cob once in a while. Please check with scientists who are not getting money from the public trough to color their answer. There is just too much junk science out there. Better still monitor your own gas mileage. You would have to know what it was before the ethanol was added, however. This is what I did. On the slight plus side, a small amount of alcohol will get rid of condensation water in the bottom of the tank. Much, much less than 10% of the fuel tank is needed for this occasionally. Additionally I did not weigh any possible emissions pollution advantages. Possibly less ethanol will give the same possible emissions reduction if that is the motivation. That would just be a stop gap measure that would eventually be negated if the population continues to grow past one child per family as discussed above. I understand that carbon dioxide is claimed to be the real cause of global warming. Cars emit carbon monoxide, which is different from carbon dioxide. Carbon monoxide is poisonous, and carbon dioxide is not. Dry ice is frozen carbon dioxide. We must encourage entrepreneurs in the future. 1. There are those that work for the government such as teachers, military service people, police personnel, fire fighters, government service workers, and postal workers. These people generally seek security of income without having any competitive urge. They tend to take a position that the government should be all things to all people, cradle-to-grave. These people tend to be liberals. Many politicians fall into this category. They often are creative from a literary or art perspective; however, they do not tend to be entrepreneurs. They don’t have to find needs for products and services, fulfill those needs, make payrolls, and hopefully eventually make a product or fulfill a need that is in demand and provides funds for them to live on and save after paying all expenses. These expenses also include taxes, replacement depreciation, and have inflation factored in. These liberal people will often also figure that they better spend every penny they get, including traveling, because the government can’t tax what they don’t have. 2. There are those that work for themselves or others in companies that must show a profit. They are often creative, competitive, and they develop new products and services that they hope are in demand. Getting started is quite risky with a high chance of failure. They are entrepreneurs. They find needs for products and services, fulfill those needs, make payrolls, and hopefully eventually make a product or fulfill a need. Hopefully their product or service is sufficiently in demand that it provides funds for them to live on and save after paying all expenses including taxes, replacement depreciation, and inflation. These people tend to be conservatives, and they are the future of this country. They make things happen. To the extent that government increasingly taxes entrepreneurs, they will give up or go out of the country. They will sometimes figure that the risk is just not worth the hoped for rewards. Then they will sit back and coast through life expecting the government to take care of them after minimal expenditure of time and full expenditure of all the money they receive. Because the teachers are of the first group, they tend to teach the philosophy of the liberal to the detriment of nurturing entrepreneurs of the future. We need entrepreneurial classes taught in high school. Guest speakers can come in from the business community to show what running a business is all about. Venture capitalists can come in showing what they are looking for in startup companies to cause them to be interested in investing funds. The whole process will be explained to the student. This will provide knowledge to develop new businesses in the future. This is far better than the states competing aggressively for the limited number of pre-existing businesses out there with ever increasing tax incentives. However, incentives will have to be used in order for businesses to voluntarily hire Americans at home rather than their hiring off-shore company employees. For businesses it is all a matter of dollars and cents. What is best for their bottom line? Taxes to confiscate wealth after it has already been taxed as income through estate taxes and punishment taxes of businesses will just drive people of wealth and global businesses away. I believe that individuals and businesses should be left alone to develop their successes as much as and as fast as possible. This, of course, applies as long as they don't harm others. People should be given incentives, so they can figure out on their own to do something that the government wants them to do. It is a failure of government when it encroaches on the wealth of individuals and businesses after they have already been taxed. Cleverly controlling government costs by thinking outside the box, such as the social problems I helped solve (as is shown on my web site), will save billions of dollars. However, government spending restraint should also come into play. In the past when the savings from my solutions were realized, the government officials could not wait to spend the huge amount of money fast enough. One billionaire advocated higher estate taxes. Could the motivation be to drive profitable businesses into forced sales at fire-sale prices just to pay the estate tax when an owner dies? Is buying these government induced distressed properties their business motivation? To reduce the fear of liability, a class can teach how to represent oneself in court in order to keep expense exposure down. Judges can be guest speakers. This is not so preposterous. To win in court is just a matter of using common sense coupled with the guidelines of the very clearly written “Rules of Civil Procedure” provided by each court. I took a leading law firm to court for legal malpractice. I represented myself. They had 22 partners and owners that I was suing at the superior court level. I won a settlement. It was easy. Please see the write up on my web site. I also took on OSHA (Occupational Safety and Health Administration) representing myself in Federal court. They flew in 3 attorneys from Washington, D.C. I won that one, too. It was easy. Lawyers like to say that if you represent yourself in court, you have a fool for an attorney. Baloney. That expression is designed to maximize law firm income. I learned that, win or lose, each side pays for his own attorney’s fees. Sometimes a generous judge will give me, the winner, around $600 statutory attorney fees when my actual attorney fees can be $100,000 or more, but this is rare. Faced with this, I am far better off representing myself. In that way my expenses are minimal, and my rewards are much, much greater. In my opinion, nothing can dry up seed money for a startup company faster than lawyers’ fees to fight a lawsuit. If I can win my case or get a settlement by representing myself against a prestigious law firm, then I am certainly not a fool. If lawyers claim I have a fool for an attorney as a winner, then what does that make them? I strongly recommend that courses be taught in high school and business school on how to represent oneself in court. I am not special. If I can do it, others can do it. Please see my video and write-up on my web site for legal tort reform for businesses to avoid this form of legalized blackmail. Please also refer to my web site for additional considerations on Tort Reform ( http://www.franklinlacy.com ). As a retired 71 year old, all of my income comes from capital gains, interest (2.4% rate), and dividends (3 ½ % rate). Each year, inflation gobbles up almost all of it, yet you insist on collecting income taxes on this no-existent income. You want to tax me on inflation. This is also true for capital gains. If I buy a house for $100,000 and have to sell it a year later for $103,500 and if inflation is 3 ½ %, you insist on extracting taxes on $3,500 from my retirement holdings even though I didn’t make anything when you factor in inflation. You are literally shrinking my holdings while I am alive through these false income taxes because you do not allow for inflation. I worked very hard all my life scrimping and doing without and putting away what I can after living expenses, taxes, and inflation gobbles up much of my earnings. Now you want to confiscate it. Do you know how long I will live (not as a group but as an individual)? Do you just want to snuff us out when you are through confiscating our nest egg by making us feel like we are burdens on our families? Or are you just depriving us of enjoying the fruits of our many years of labor and sacrifice? Now some of you want to accelerate the process by taxing at full income tax rates this bogus before inflation alleged income. That is truly terrible!!!! Please don’t tax the elderly for capital gains, interest, and dividends. I can't read using fluorescent light bulbs. My eyes will strain, become seriously irritated, become blood shot, and I have to stop reading under fluorescent lighting. I have found that I can ONLY READ WITH INCANDESCENT LIGHT BULBS. Possibly our legislators forgot to factor all this in when they decided to ban incandescent bulbs. That is awful! Possibly new technology can eliminate this problem. My solutions have a common thread of saving huge amounts of taxpayer dollars in addition to my providing workable, verifiable, successful solutions. I got both parties to adopt my solutions. My USSR demise solution resulted in a peace dividend. My Welfare Reform solution resulted in our saving billions of dollars. My Medicare/Medicaid/Healthcare solution will result in over 100 billion dollars in annual savings in addition to driving down healthcare costs without degradation of the quality of treatment. My tort reform solution will save business billions of dollars. My Iraq/suicide bomber solutions of April 2007, which are being implemented, will save many billions of dollars, is now saving lives, and is preventing suicide bombers. My education solution is pro-business and pro-jobs. All of this is necessary for building and growing business with maximized employment and revenue. As usual, please take these solutions as your own, so they will be supported more enthusiastically and passed sooner. Please let me know your thinking. I am doing this because I really care about our country.